Star Plus, Chhote Ustaad, produced by Sai Baba Telefilms launches tonight on 24th July at 9pm slot every Saturday and Sunday. As we all know Omi Vaidya who won a lot of fans for his comic portrayal as Chatur in the movie 3 Idiots will be hosting the show. The latest news is that Omi has got his co-host for the show in the very popular playback singer down south, Chinmayi .K. Sripadaa the girl who has been roped in by Gajendra Singh as a second host of Chhote Ustaad. A Little Birdie tells us that, "Chinmayi is presently hosting Sai Baba Telefilms Tamil version of Amul Music ka Maha Muqqabla titled Sangeet Mahayudham on Sun TV which has been on air for a month now. Gajendra Singh who was very much pleased with her style of hosting immediately gave her the opportunity of hosting his new sangeet musical show." Says Chinmayi to tellybuzz, "I'm presently hosting Sangeeta Mahayuddam for Gajendra Singh when he saw me there he decided to take me as a host for Chhote Ustaad and also inquired about my proficiency in Hindi language. I told him he's taking a big risk by choosing me. Having said this I have sung for few Hindi film songs and I recently sung a number in movie Lamha. Above all as a kid I was brought up in Mumbai after which my mother moved to Chennai for certain reasons. 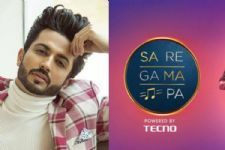 It is great fun to work with Gajendra Singh as he has been a pillar in the Hindi music industry and has given singers like Sonu Nigam, Shaan, Sunidhi Chauhan, etc." Talking further Chinmayi said, "I have shot for first two episodes of the show I'll take it up as it requires me to shoot at Mumbai for just one day in a week. I'm enjoying this stint, I hope that the concept of bringing together the contestants from Indian and Pakistan appeals to the audience and we see a change in the mindset of all." Tune in to Chhote Ustaad tonight at 9pm on Star Plus. Author & Reporter: Srividya Rajesh. 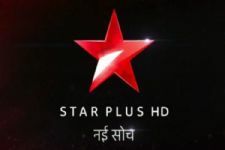 This Star Plus show is all set to come back with a Season 2! 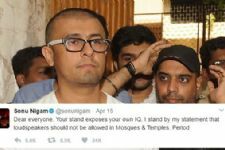 After Divyanka Tripathi, more celeb tweets pop up about the Sonu Nigam Controversy! A FURIOUS Divyanka Tripathi reacts on the Sonu Nigam controversy! This 'Renowned Singer' associates with 'Maharaja Ranjit Singh'! I absolutely love her voice. She is too good in the tamil show. Way to go Chinmayi. I am all in to see you more and ALL THE BEST for everything you do. chinmayi is really sweet but omi vaidya is bit irritating...he ws guhd in 3 idiots but as a anchor he's nt guhd. Kudos to Gajendra Singh for coming up with the concept of getting together voices from India & Pakistan..the kids are Gr8! All the Best to Omi n Chinmayi too..
nice concept... and Chinmayi has a great voice! nice concept ..all the best to them! is this saibaba telefilms producing kajri on mahuaa bangla. gr8 concept.thank u india...and thank u star plus. And it is going to be the second season.